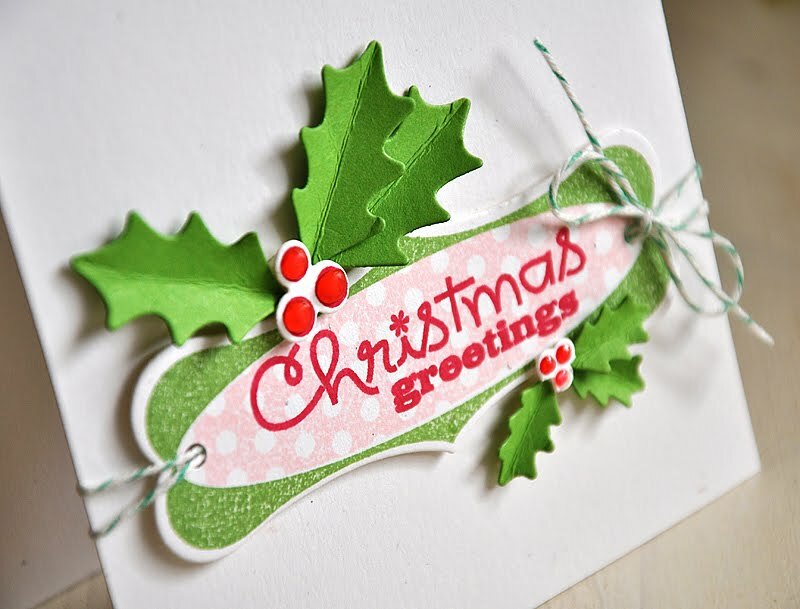 Hello and welcome to the Paper Crafts 12 Days of Christmas Blog Hop! 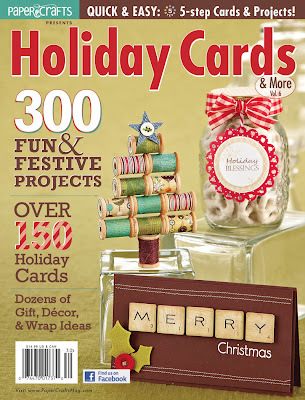 Today, 12 of the most-published designers of today's special issue, Holiday Cards & More Vol. 6, are bring you some quick 'n easy holiday cards. First off, check out this seasons issue.... Goodness, this cover is gorgeous! 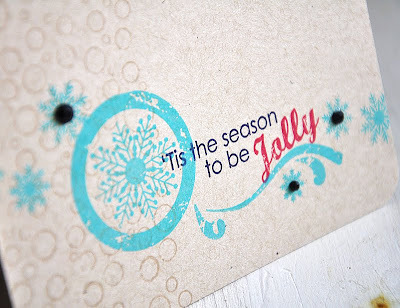 I don't know about you, but I find creating for the holiday season, in the middle of the year, quite a challenge. This time around, when creating my magazine submission, I tried to challenge myself a little more and created an assortment of non-card projects. Turns out to have been a good call, because 5 of my non-card projects (along with a few cards too) were picked up for this issue. 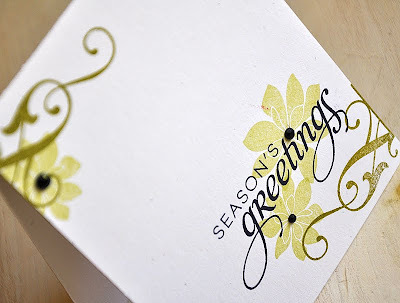 I still have yet to receive my own Holiday Cards & More Vol. 6 issues, but I am anxiously awaiting a peek! Now, how about a single layer quick 'n easy card, perfect for mass producing in no time... I started with a Rustic White card base. 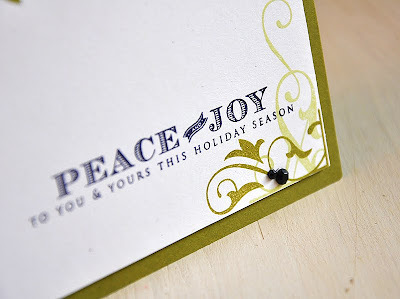 Stamped the sentiment, from Stylish Sentiments: Holiday, in True Black ink. Layered a few small and large poinsettias, from Bells & Boughs, in Spring Moss ink. 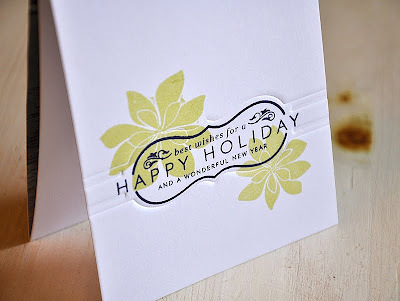 Then stamped flourishes, from Holiday Photo Finishers, into the corners using Ripe Avocado ink. Finished the card off with a few black rhinestones. And that's it! I'm not done yet! Who's up for a prize?! 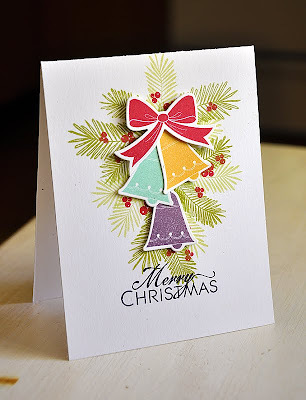 Make sure you stop by the Paper Craft Connection blog, you can leave them a comment and be entered into their fabulous giveaway. Be sure to post your comment by 2 AM EST on Sunday, October 2nd. Also, don't forget to leave me a comment as well. Of course, I'd love to hear from you! 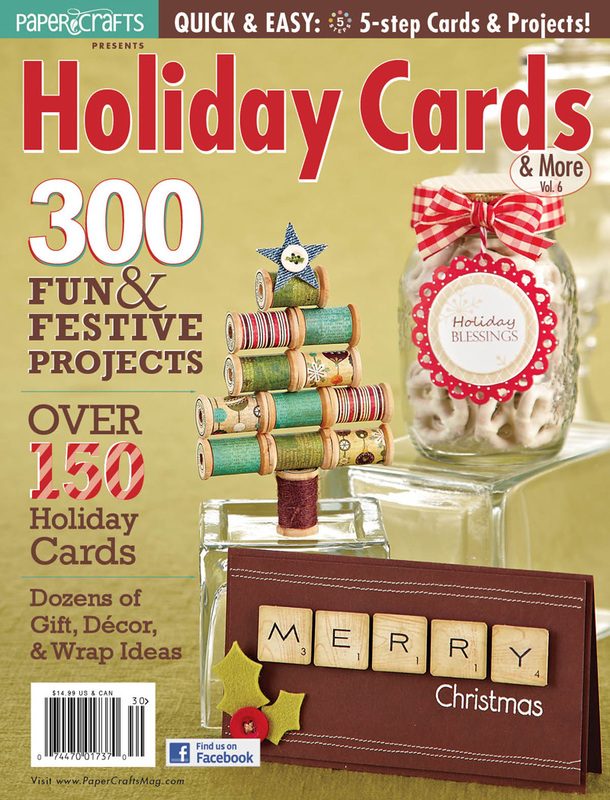 But I'll also be selecting a winner to receive an issue of Holiday Cards & More Vol. 6 for free! Be sure to post your comment by 2 AM EST on Sunday, October 2nd. I look forward to hearing from you! That's it from me today! Thanks for stopping by and I hope you have a wonderful one! First up Holiday Lights by Dawn McVey. 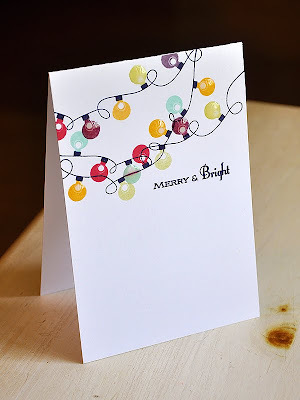 I stamped a few bent Christmas light strand at the top of a white card base. 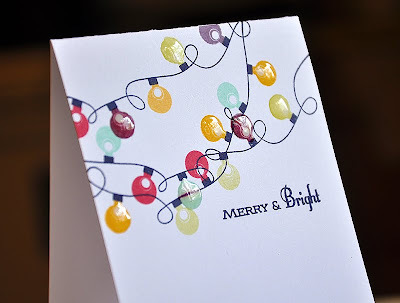 Stamped the bulbs in a color combo of Pure Poppy, Summer Sunrise, Aqua Mist, Spring Moss & Plum Pudding. Touched up a few with glossy accents to finish the card off. Next, Flower Fusion #8 by Melissa Bickford. 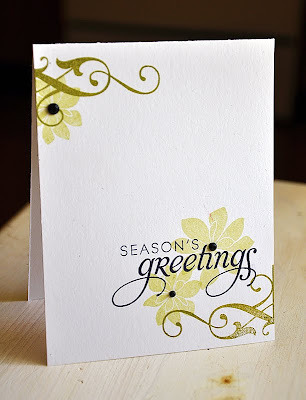 Stamped the flowers onto a kraft card base in Fresh Snow ink and embellished with Harvest Gold Buttons. Attached, trimmed and impressed Mat Stack #5 die cut and wrapped with 1/4" white silk ribbon. Finished it off with a sentiment from the same set. 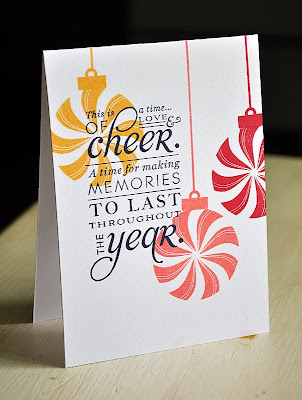 Now for some Winter Cheer by Tiffany Pastor. 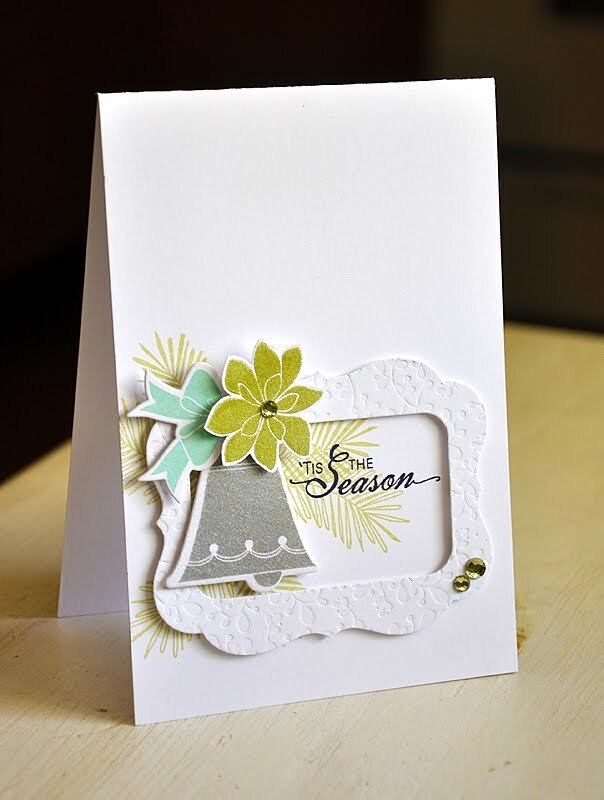 Stamped a drift of snowflakes across the front of a kraft card base in Hawaiian Shores. Stamped a jolly sentiment and embellished with a few black rhinestones. 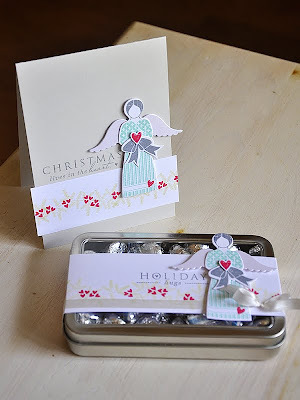 Here's another sweet set by Dawn McVey, Candy Cane Christmas. Stamped these candy ornaments in Summer Sunrise, Berry Sorbet & Pure Poppy. 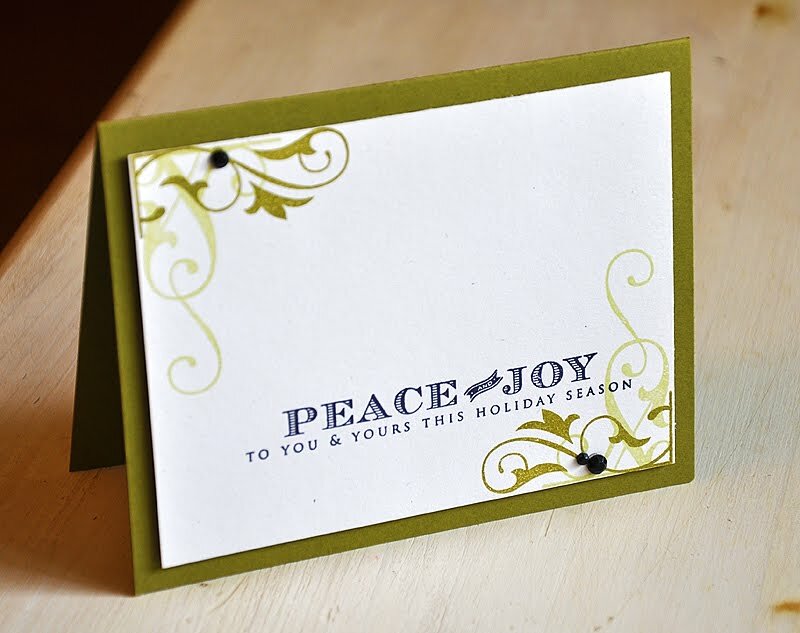 Finished it off with a stylish sentiment from Stylish Sentiments: Holiday by Nichole Heady. Next up, Tag-its #8 by Heather Nichols. I paired this set with one of the new Damask Snowflake dies. Thread the snowflake with a strand of Autumn Rose twill ribbon. 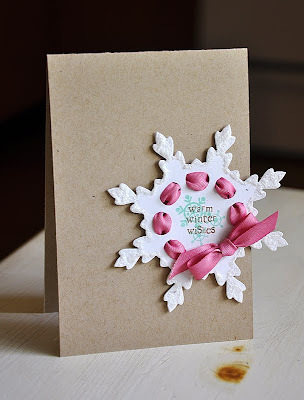 Stamped the snowflake center with a few snowflakes and a wintry sentiment and then attached to a kraft card base. 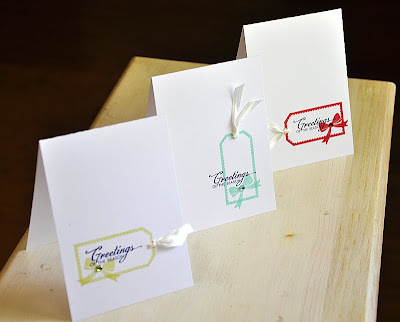 And last but not lease Christmas Labels by Lisa Johnson. Stamped a retro sentiment label in New Leaf, Sweet Blush & Pure Poppy. Embellished with a few fun holly leaves and berries, die cut using the new Holly Jolly dies. That's all from me today. All supplies will be listed below soon. Thanks for stopping by and have a great one! Welcome back to the final day of the Papertrey Ink Countdown. For today's project I've chosen to focus on other uses for my new Bells & Boughs set, something other than a Christmas card. First up, an invitation... I've chose to go with a bit of a rustic theme, perfect for a holiday, anniversary, birthday or wedding party. I've combined Bells & Boughs with Table Service to create a table setting focal point. 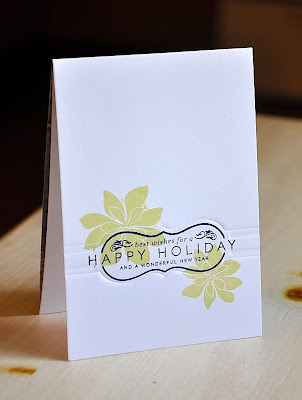 Stamped a kraft Mat Stack #1 die cut with Background Basics: Houndstooth in Simply Chartreuse. 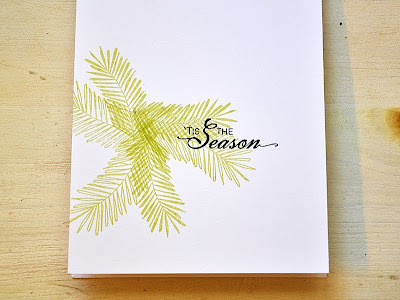 Stamped a Rustic Cream card base with a few boughs in Spring Moss and a sentiment in Vintage Touch Chai ink. 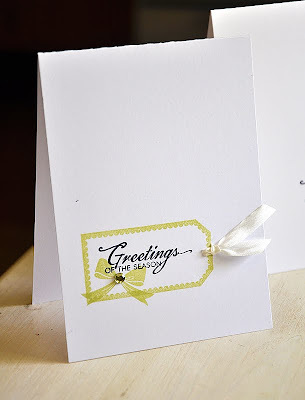 To keep with the rustic feel, I also inked all edges with the Vintage Touch Duo. 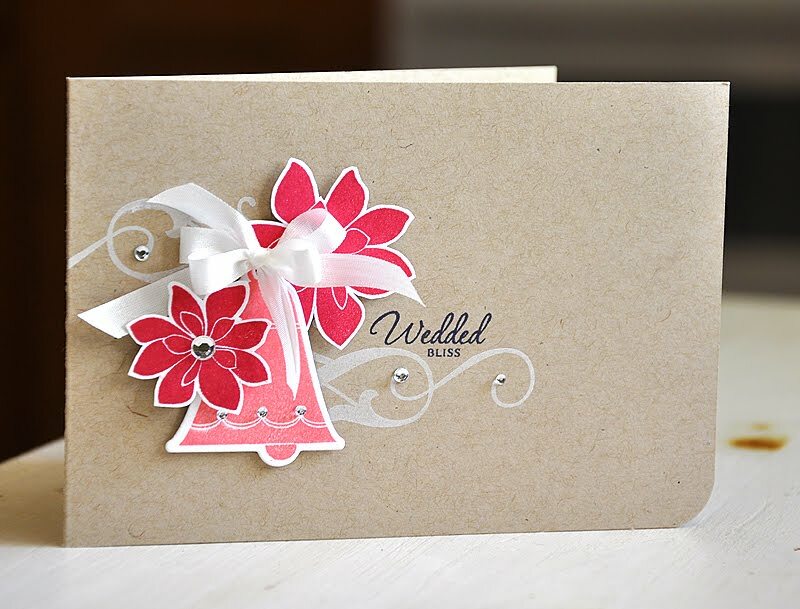 Nichole has already shared with you, in her post yesterday, how well this set works for creating wedding cards. 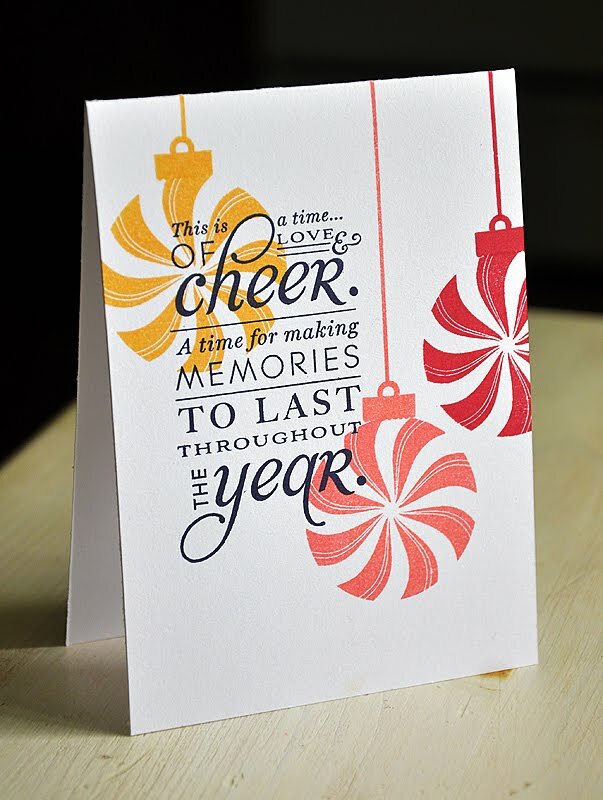 I have another one to share with you today too, but keep in mind that by changing out this sentiment to a "Happy Anniversary" you've also got a card design perfect for such an occasion. I started this card by stamping a couple flourishes (from Holiday Photo Finishers) in Fresh Snow ink onto a kraft card base. 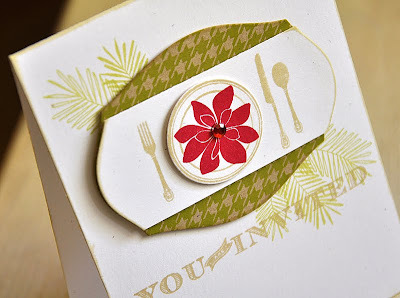 Stamped and cut out a couple Pure Poppy poinsettias. 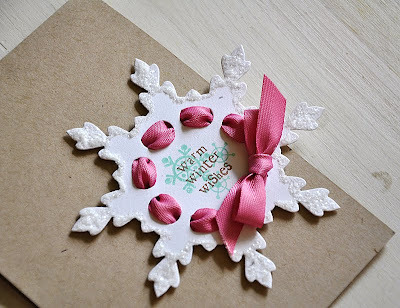 Die cut and stamped a Berry Sorbet bell, punched a hole at the top and tied with a silk ribbon bow. Attached all to the card base, over the flourishes, at varying heights. Finished the card off with a sentiment and a few clear rhinestones. That's it from me today! But don't forget, tomorrow (September 15th) is the day to get your hands on my newest stamp set and coordinating die, at Papertrey Ink! Now, for even more sneak peek goodness, be sure to visit Nichole Heady, Dawn McVey, Heather Nichols, Melissa Bickford, Lisa Johnson & Tiffany Pastor. Hello all! 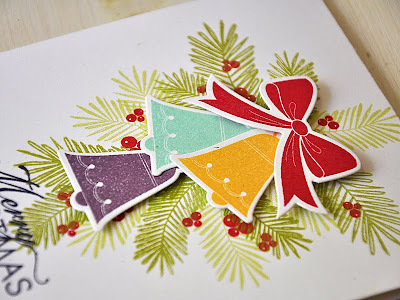 Today is the last day of the Papertrey Ink Countdown as well as the second Group Post day. This time around each of us, on the design team, are showcasing the set Holiday Photo Finishers, designed by Nichole Heady. Our assignment is to create two projects, one photo card and one non-photo card. 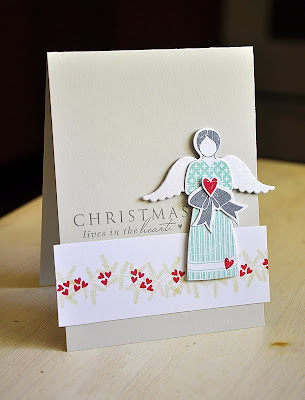 Check out what I came up with... To keep things simple I started by using one of the new tri-fold cards. 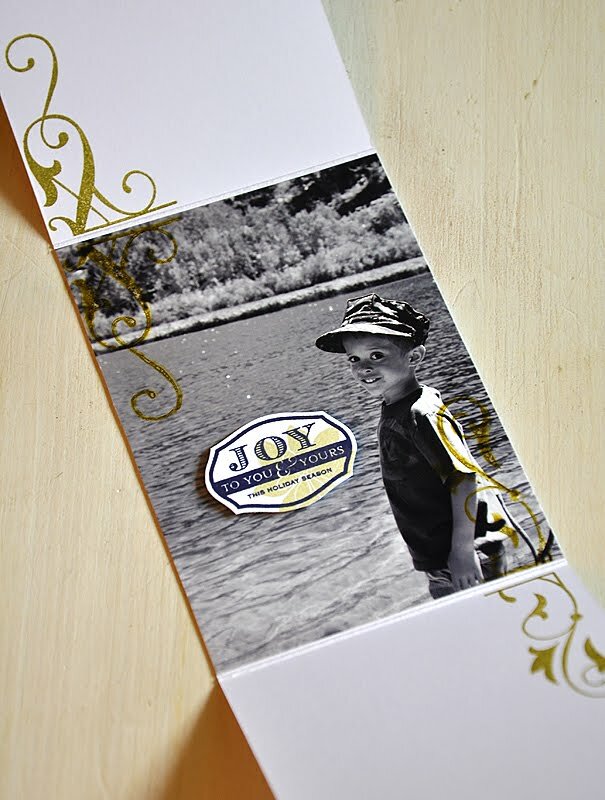 I embossed the front flap with one of the Photo Finish Strip Dies and stamped a coordinating sentiment in True Black. 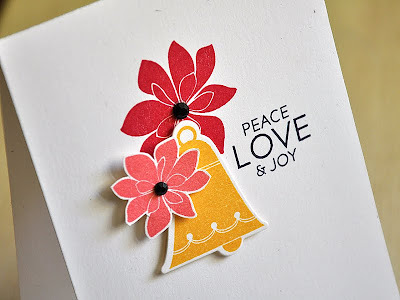 Then stamped a large and small Bells & Boughs poinsettia flower in Spring Moss. Now, onto the inside... I raised the front flap and stamped a few corner flourishes in Ripe Avocado and Spring Moss. Placed a black and white photo into the center of the tri-fold card. 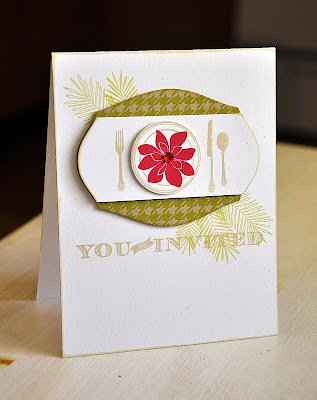 To add a pop of color I stamped the flourishes, in Ripe Avocado, onto the photo and the card flaps. To finished the card off I stamped a "Joy" label in True Black and a poinsettia in Spring Moss onto white cardstock, cut out and attached to the photo with dimensional adhesive. Next up, the non-photo card... 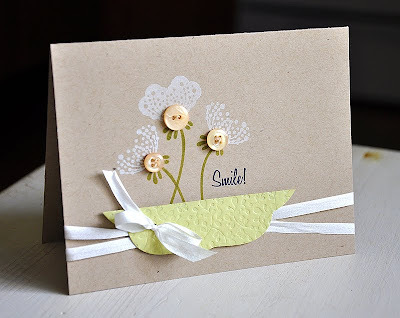 I started with a Rustic Cream cardstock block, stamped flourishes into the corners using Ripe Avocado and Spring Moss inks, stamped with a sentiment and attached to a Ripe Avocado card base. Finished the card off with a few black rhinestones. It's a super simple, yet elegant design, that can easily be mass produced. Hello all! 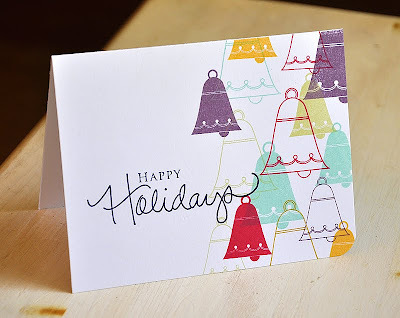 It's day four of the Papertrey Ink Countdown and today I'm joining up with Nichole Heady to bring you even more of my new set... Bells & Boughs (which is available beginning September 15th at Papertrey Ink!). Nichole will have all the details regarding this set and its coordinating dies, so make sure you stop by (if you haven't already). 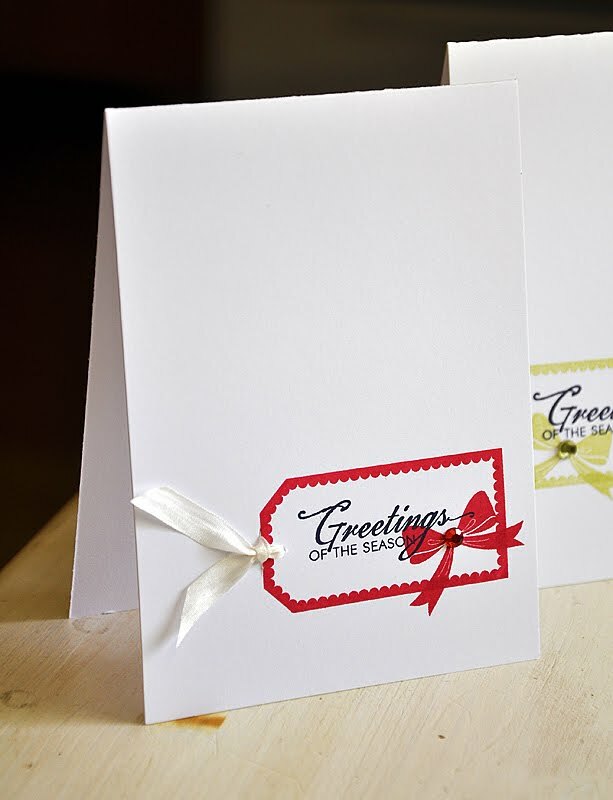 First up, a simple single layer card that's sure to give you no problems when sending it through the mail. Up to this point I've shared with you only the solid bell images. 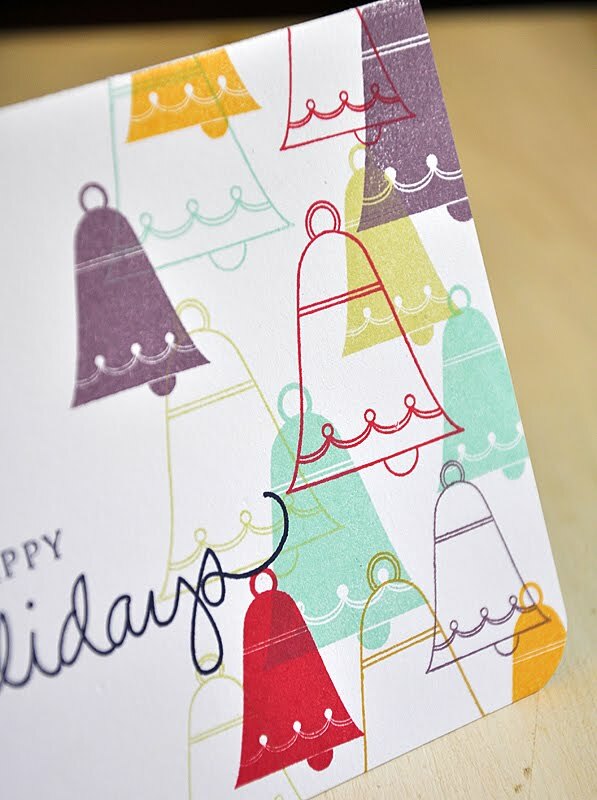 Well, also included in this set are outlined bells. 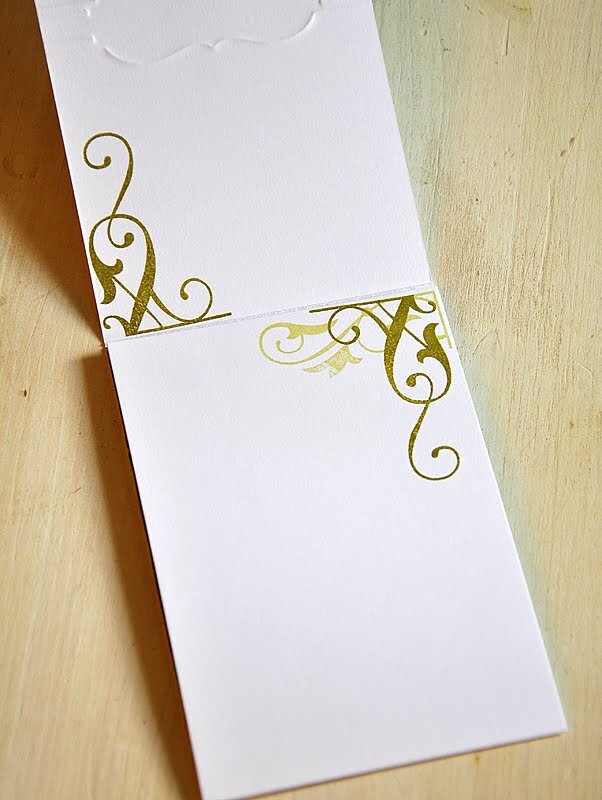 Perfect for pulling out those Copic markers or for pairing with it's solid companions, like I did on today's card. I stamped all four bells onto a white card base in a color combo of Pure Poppy, Aqua Mist, Spring Moss & Summer Sunrise. Next up, I pulled out the wreath and berry images (from Wreath for All Seasons) and paired them with the smallest bough branch from Bells & Boughs. 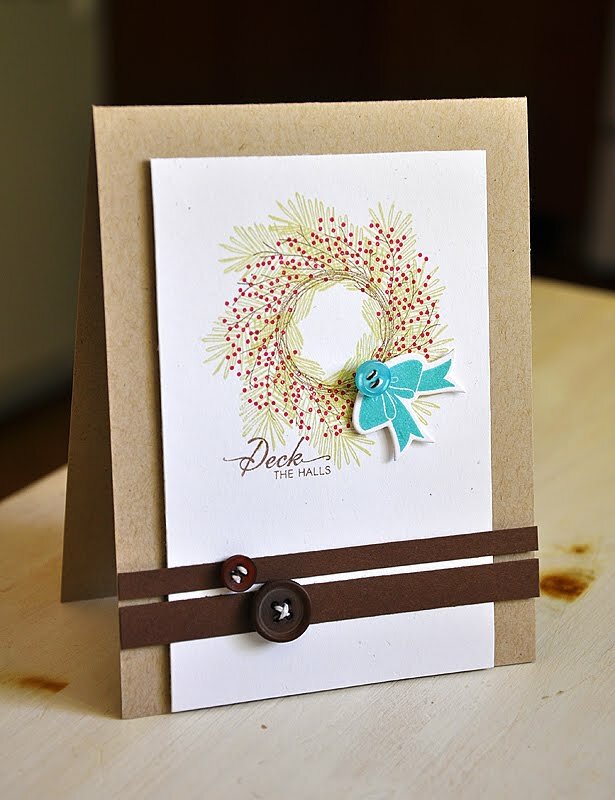 I stamped the wreath in Dark Chocolate, the boughs in Spring Moss, the berries in Pure Poppy and a Bells & Boughs sentiment in Dark Chocolate onto a Rustic Cream cardstock block. Then attached the stamped block onto a kraft card base. Adhered a couple strips of Dark Chocolate cardstock and embellished with matching buttons. 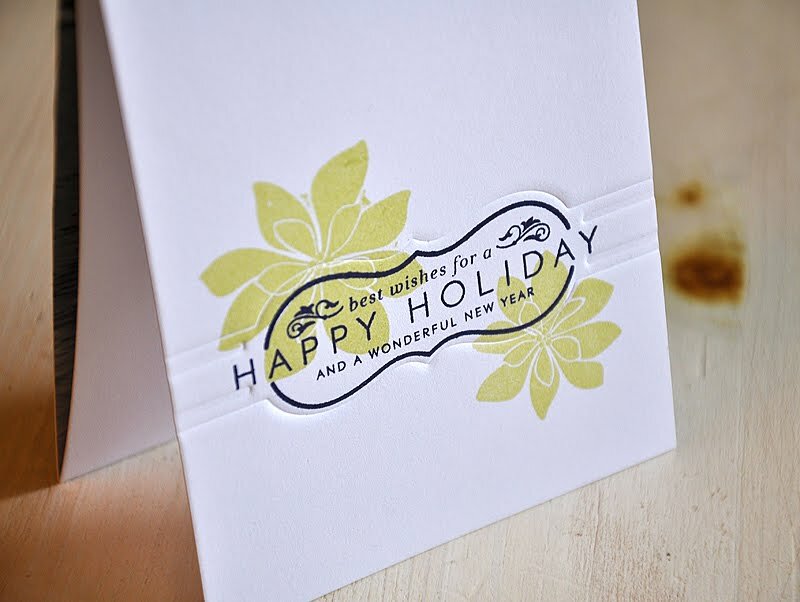 Finished the card off with a die cut and stamped Hawaiian Shores bow and matching button. Here's a super cute and super simple holiday card trio. 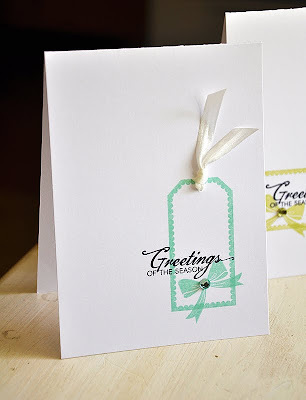 I simply stamped the tag (from Fillable Frames Additions 2) directly onto a white card base. Within the frame I stamped a small bow and sentiment, both from Bells & Boughs. To give these tag a realistic and fun look, I pierced a hole inside the tag top and cut a slit just outside of the tag top. Then threaded white silk ribbon through the two holes (using a needle) in pretty much the same way I would have had this been a real tag. One in Spring Moss. One in Aqua Mist. I think I like this arrangement the best out of the three. And one in Pure Poppy. I pulled out the Bells & Boughs poinsettias for this last card. Stamped them in both Pure Poppy and Spring Moss and cut them out. To create leaves, I cut the Spring Moss poinsettia petals apart and attached the sections behind the Pure Poppy ones. To create this Mega Mat Stack #2, I die cut two from white cardstock. Stamped the first one with Background Basics: Houndstooth (in Smoky Shadow), trimmed the top and bottom off of the second one and then attached the two together. Once assembled, I stamped with "Merry Christmas" and "From Our Family to Yours" sentiments (both from Bells & Boughs) and attached to a Soft Stone card base. Embellished with True Black buttons, the assembled poinsettias and black rhinestones. Well, that's it from me today. I hope you've enjoyed this detailed look into my new goodies for the month of September. 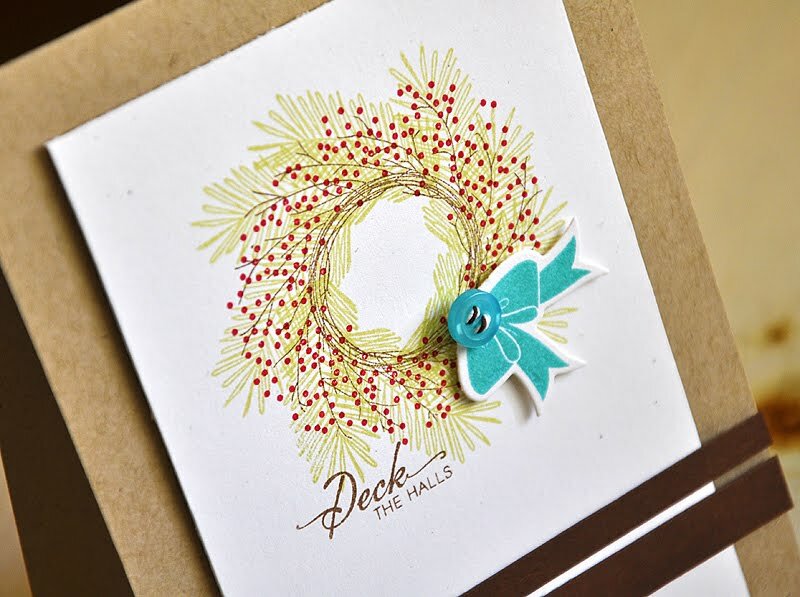 Remember Bells & Boughs and its coordinating dies will all be available for purchase starting September 15th, at Papertrey Ink. I honestly can't wait to see this set in your hands and in action! But in the mean time, please let me know what you think so far. I'd love to hear!!! Now, for even more sneak peek goodness, be sure to visit Nichole Heady, Michelle Wooderson, Dawn McVey, Heather Nichols, Melissa Bickford, Lisa Johnson & Tiffany Pastor. Anyways, back to business... It's day three of the Papertrey Ink Countdown and I've got a couple more Bells & Boughs cards to share with you today... I'll start things off with a simple one today. I simply stamped a white card base with a large Pure Poppy poinsettia and a sentiment. 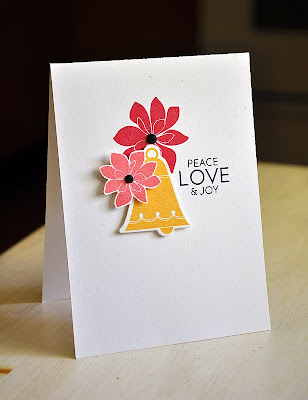 Die cut and stamped a Summer Sunrise bell. Stamped and hand cut a small Berry Sorbet poinsettia. 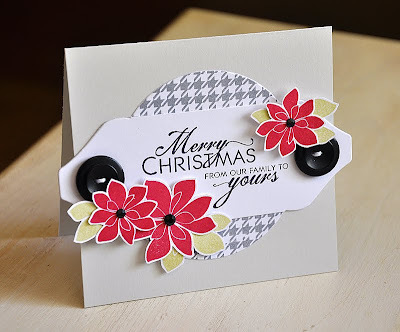 Then attached both to the card base, at varying heights, and embellished with black rhinestones. 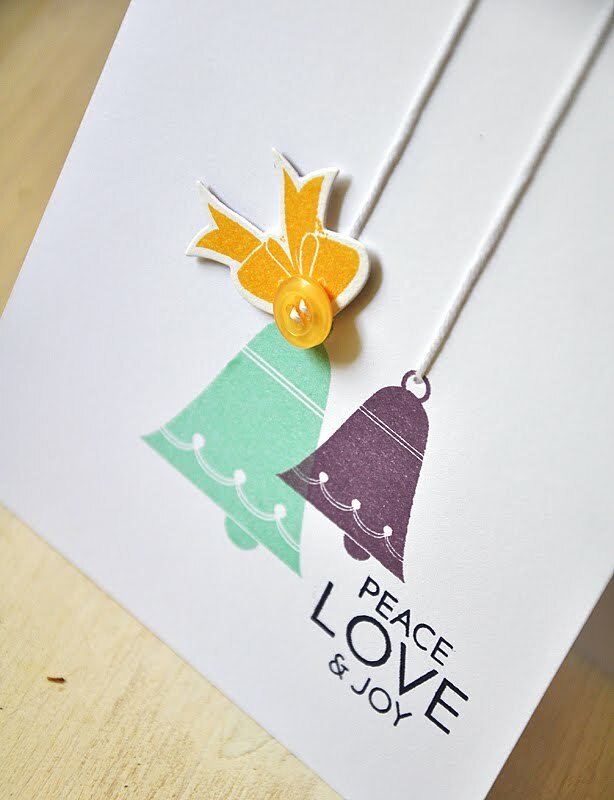 This next one features a trio of hanging bells in the colors of Summer Sunrise, Aqua Mist & Plum Pudding. Started by stamping a bunching of bough branches in Spring Moss and Ripe Avocado. Over this I stamped the berries in Pure Poppy and a sentiment in True Black. Arranged and attached the bells with dimensional adhesive. Then adhered a Pure Poppy die cut bow into place with an added layer of dimensional adhesive to give it a bit more height. Well, that's it from me today. I hope you've enjoyed another look into my new goodies for the month of September. Remember Bells & Boughs and the coordinating die collection will be available for purchase starting September 15th, at Papertrey Ink. I'd love to know what you think so far!!! Now, for even more sneak peek goodness, be sure to visit Nichole Heady , Dawn McVey, Heather Nichols, Melissa Bickford, Lisa Johnson & Tiffany Pastor. Hello all! 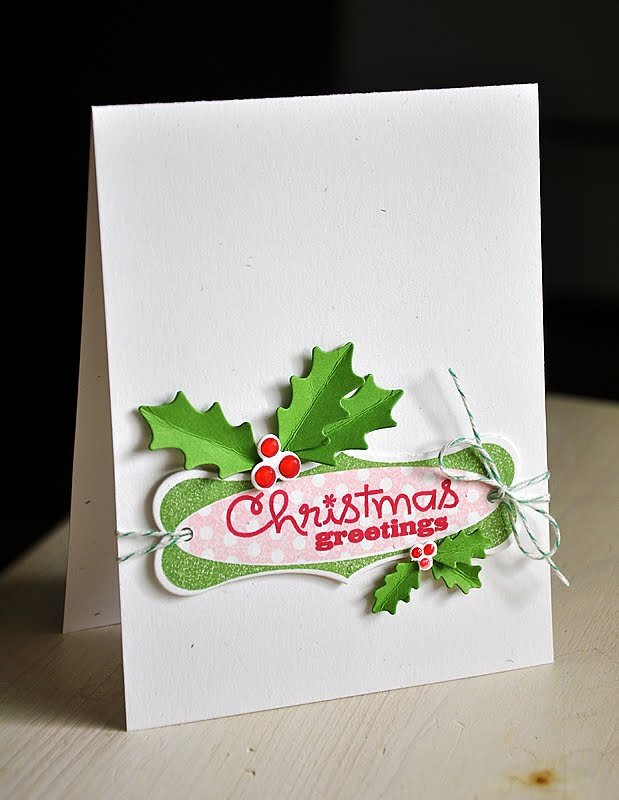 Welcome to Day 3 of the Papertrey Ink Countdown and this months first Papertrey Ink Design Team group post. 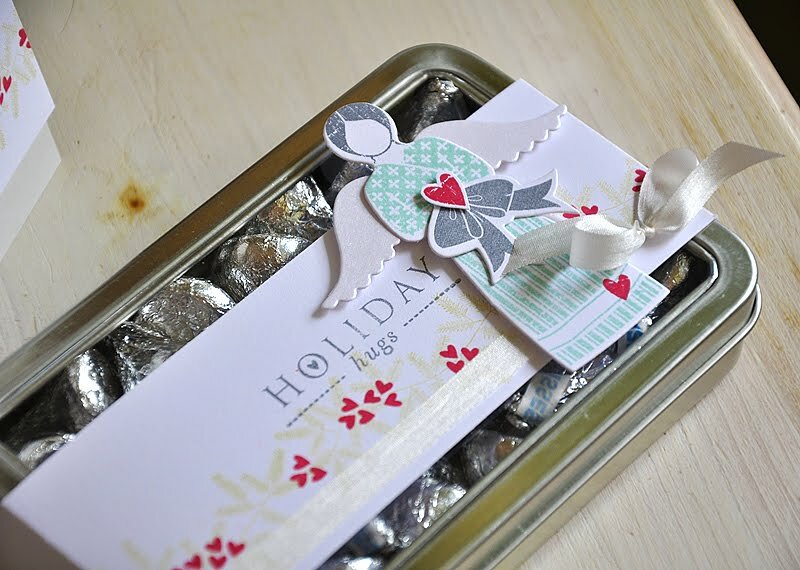 In preparation for the Christmas holidays, Nichole has asked the Design Team to create a holiday treat or treat package & a card using the new Love Lives Here: Holiday stamp set. 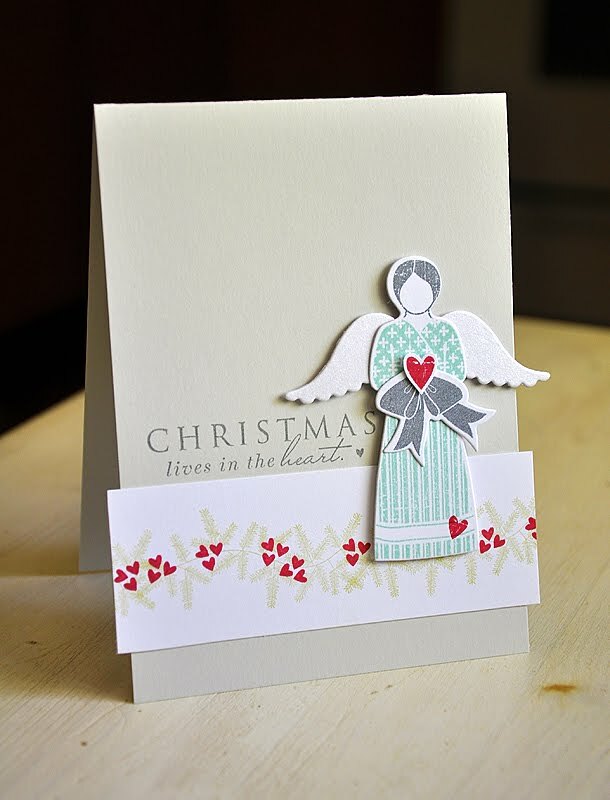 Love Lives Here: Holiday is a sweet homespun Christmas set created by Nichole Heady from a concept by Melissa Phillips. Here's my homespun treat!... 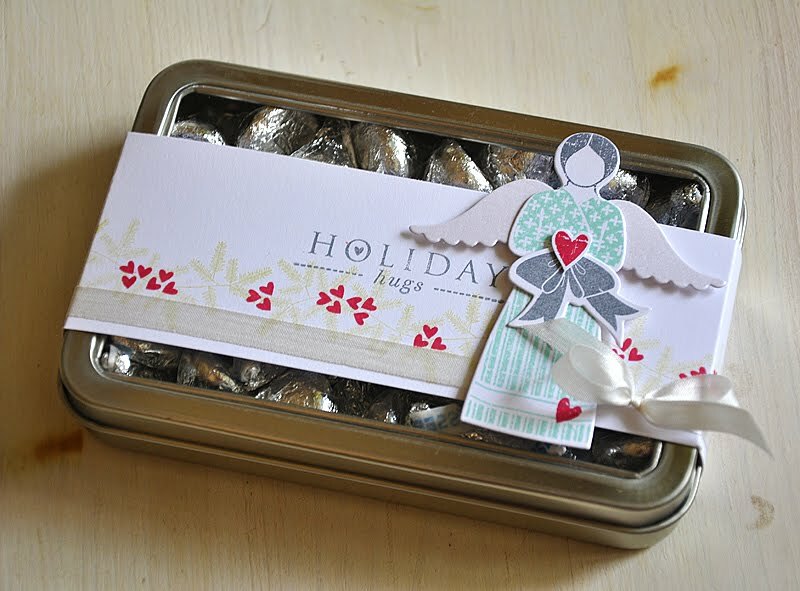 I chose to work with the adorably sweet angel for this sweet treat and card. It all started with a new to me Christmas color combo of Soft Stone, White, Aqua Mist, Pure Poppy and Spring Moss. Which I am loving! I love how the gray adds such a softness to the whole project. 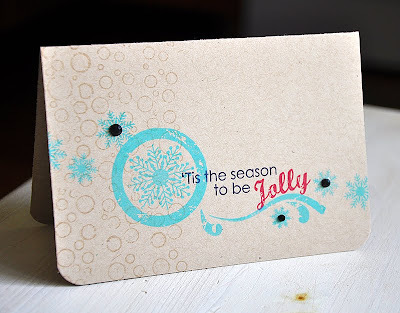 To start, I created a hand stamped strip using the bough image. I inked it up in Spring Moss and stamped a bough row. 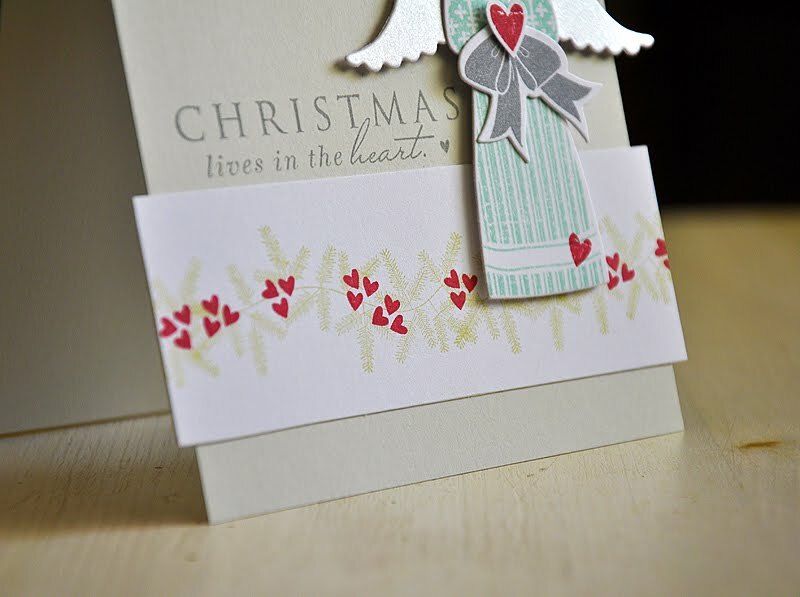 Then inked the heart trio in Pure Poppy and stamped along the bough row for a nice pop of color. Once complete, I attached it to a Soft Stone card base. 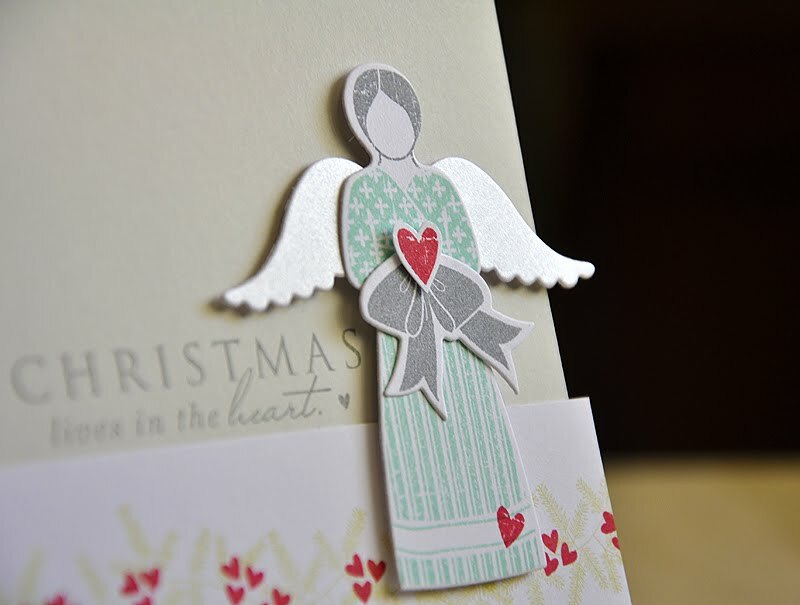 Die cut and stamped the angel in Aqua Mist and Smoky Shadow. 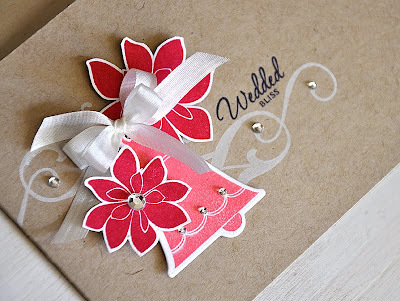 Stamped a Pure Poppy heart along the hem of the dress, attached die cut Shimmer White wings and adhered to the card base with dimensional adhesive. Into the angels hands I attached a die cut bow (from Bells & Boughs) and a hand cut heart. Finished it of with a heartfelt sentiment. Next up a coordinating treat box full of hugs and kisses. Like I did on the card above, I hand stamped a bough row along a card stock strip and then wrapped it around a Nugget Tin. 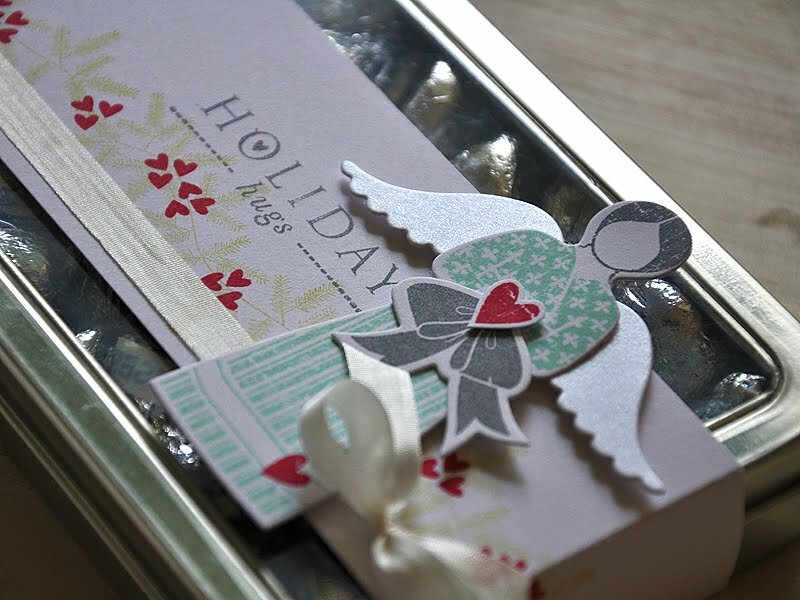 Wrapped the box with white silk ribbon, topped it off with another sweet angel and finished it of with a heartfelt sentiment that perfectly fits what's inside. Hello all! It's day two of the Papertrey Ink Countdown. I hope you all are enjoying everything so far! 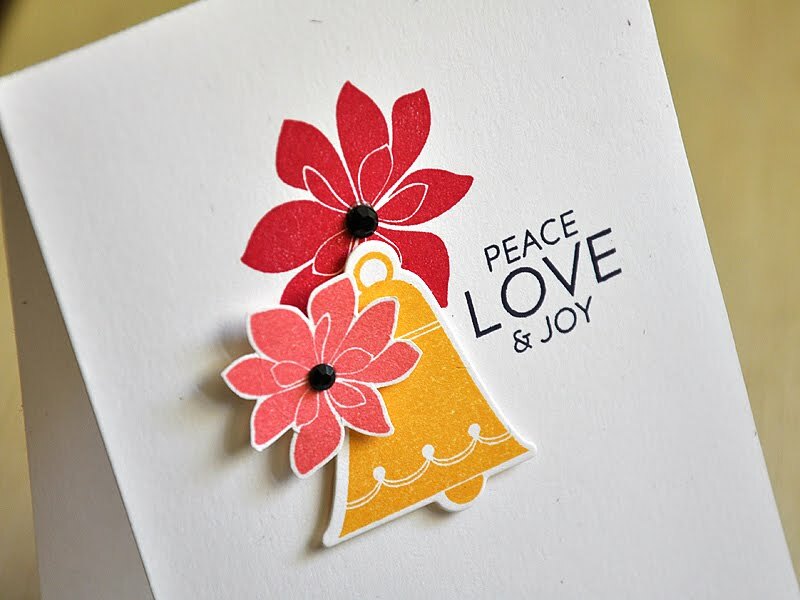 Well, I'm back today to share some more of my latest stamp sets... Bells & Boughs. This time around I'm keeping things some what simple... First up, a card perfect for mass producing. I started by stamping a white card base with a Plum Pudding small bell and an Aqua Mist large bell. 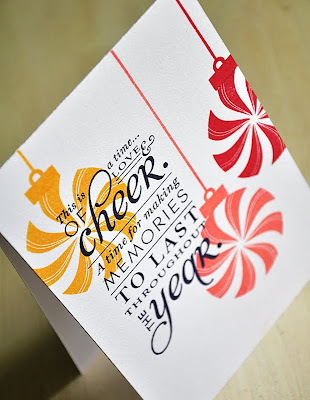 Then stamped the sentiment, I love this sentiment! I knew when creating this set I wanted a font combination that would fit a simple and modern design as well as an elegant design. I've been very happy with the end result! 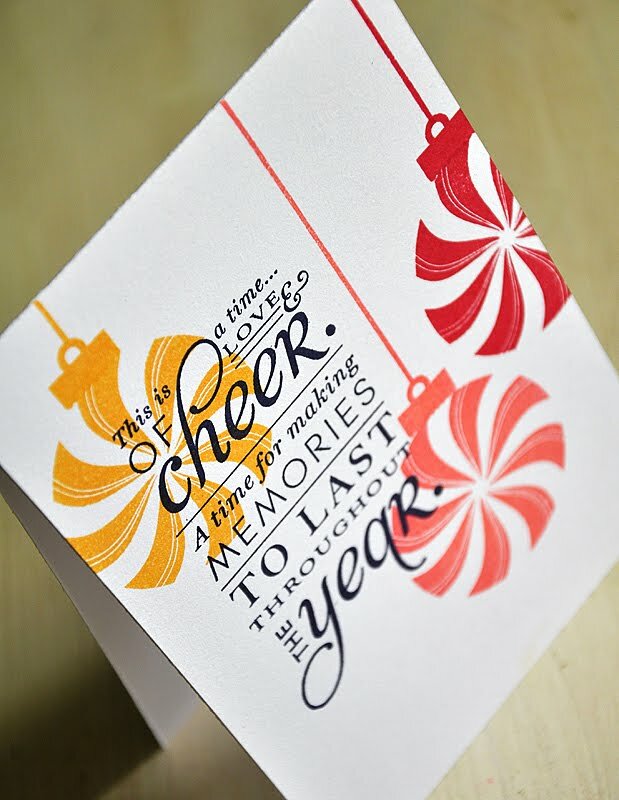 This sentiment, in particular, fits the modernly designed Christmas cards perfectly, with it's simple text and varying sizes to keep things interesting. Finished the card of with a couple strands of white embroidery floss. 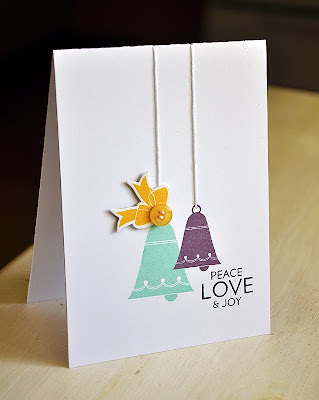 Here's How: I've pierced a hole above the bells and at the fold of the card, threaded through the holes with twine and tied ends together inside the card. 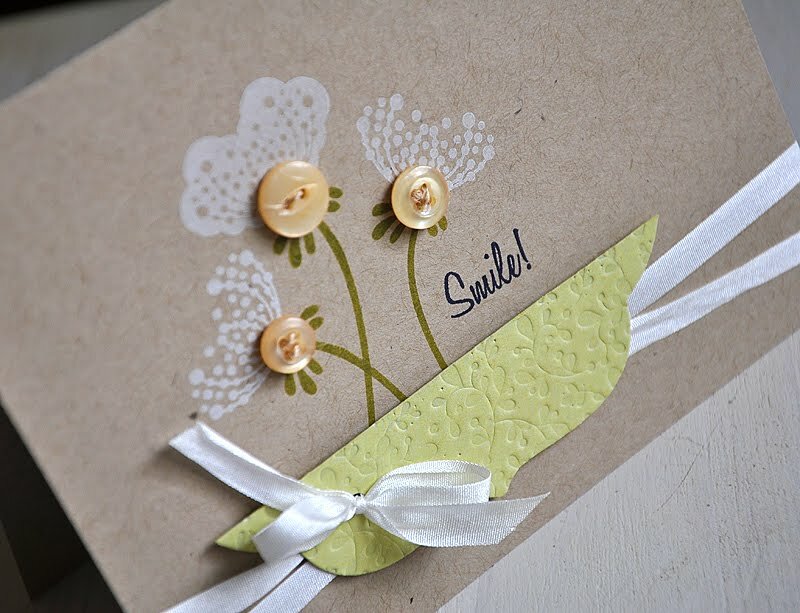 Die cut and stamped a Summer Sunrise bow, attached and embellished with a Harvest Gold button. This next card is a bit more involved but still simple to recreate. 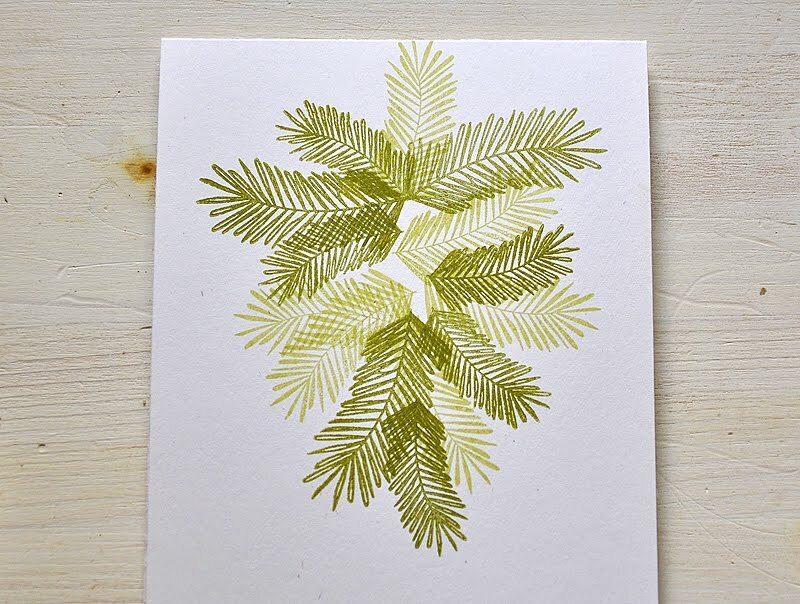 I've chosen to go with a wintry color combo of white (and lots of it), Spring Moss, Aqua Mist and Smokey Shadow. This shot gives you an idea of how I started the card and how the bough branches work. There are two outlined branches and one solid, all slightly differ in size. 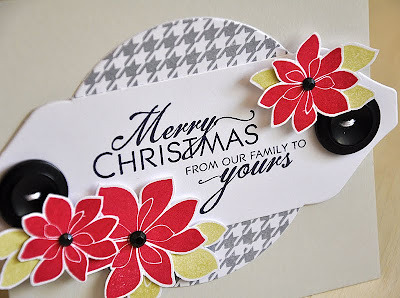 After die cutting my embellishment pieces (flower, bell, bow and frame) I figured out the arrangement which then gave me an idea of where to stamp my boughs. The frame was die cut using the Mat Stack #4 and Fillable Frames #7 dies, then impressed with the Vineyard Impression Plate and attached. 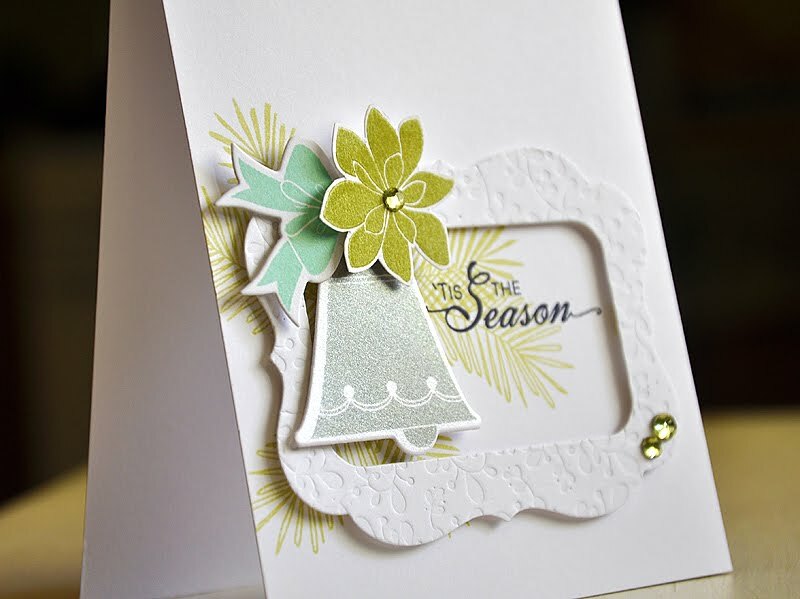 The bell was stamped in Smoky Shadow ink onto White Shimmer card stock, which gives it a gorgeous silvery shine. Love it! Attached the bell, bow and poinsettia, embellished with rhinestones and called it done. Well, that concludes my second look at Bells & Bough and the coordinating dies. I truly hope that you've enjoyed! I'd love to know what you think, so please share! Now, be sure to visit Nichole Heady, Heather Nichols and Jessica Witty for a peek at Tag It's #8, Think Big Favorites #8 & Flower Fusion #8. Also, Dawn McVey, Lisa Johnson, Tiffany Pastor & Melissa Bickford have peeks to share with you of their newest sets for the month.